What to do with Grey Mods? I thought that part of the new mod system was going to be to make grey mods useful. I thought there was going to be some way to break them down or combine them to make them into something meaningful. Clearly, I misunderstood or misread, or whatever. I was wrong. What do you all do with your 5-dot, grey (E-level) mods? I have thought about loading up my low level toons just to get them out of my inventory while increasing my GP, but the idea of all of that work seems unappealing for little to no gain. 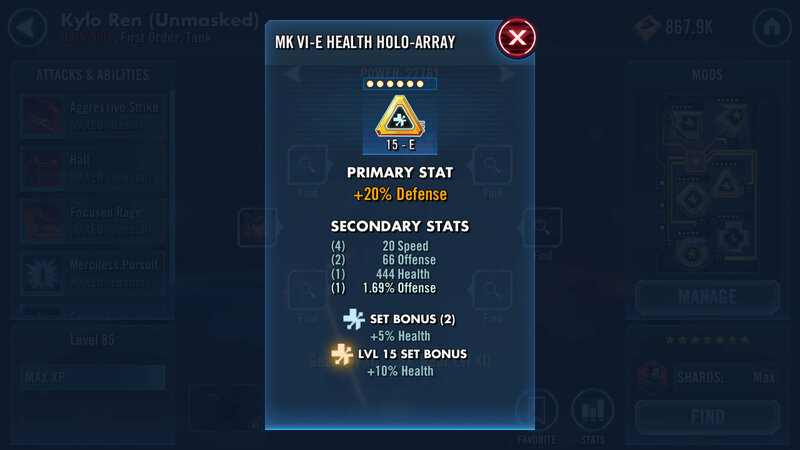 If they're good mods with good stats including speed, you can slice them to make them better. And any toon you use at all needs mods. So if you use any of those weaker toons anywhere, throw your weaker mods on them. Sell them. I sold close to 1 million credits worth this morning. I normally do a 60% mod farm, 40% slice materials farm, so I get much better starting mods to work on slicing. Selling may only work if you mod farm. Bring them to level 3 to check for a speed secondary. If you don't get a speed secondary stat and have doubles of their primary stat, sell them. If you have some commitment to farming, you wont miss them. I will usually start with the type that I am focused on farming as they will be quickly replaced and you will not fall into a situation where you cannot fill a set bonus. I'd keep grey speed arrows and maybe crit damage triangles. Depending on credits, but if you upgrade to lvl 12 for around 100k and see if speed hits. If it does, slice it to green /blue and see if it hits again. If it does, go to purple/gold. You have to take a grey mod to level 12 to see all 4 secondaries. I personally sell them all. This. Don't just sell them because they are gray. It depends how you like your gambling. Do like gambling multiple times, two of which with the same precious crystal-based energy refreshes? A - farm mods until you get decent ones that you actually want, gambling once each sim to do so. Then only spend credits on the ones you want. B - farm mods until you get random unknown stat grey mods, gambling once each sim to do so. Then gamble on upgrading at least to level 12 each mod to see if you get speed. Then, go back and spend more mod energy gaining slicing salvage, gambling once each sim to do so. Then, gamble on whether speed will roll once, twice, three times or never. I go with A. Then, when I choose to actually bother slicing, it's already a great mod and I only have to slice up to purple, gold, or 6*.